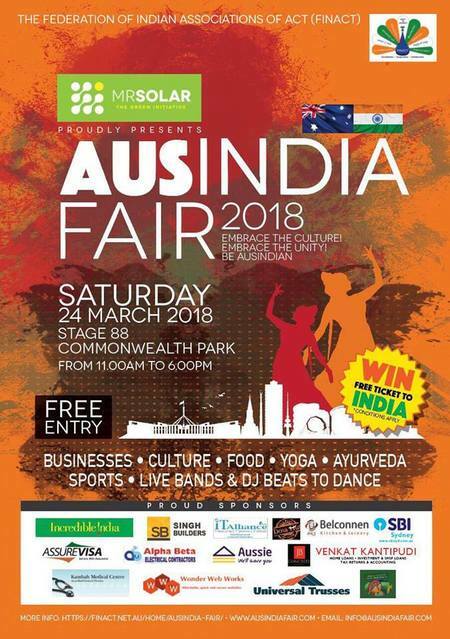 AusIndia Fair is a family-friendly festival that will be held at Stage 88, Commonwealth Park, on Saturday 24th March between 11am - 6pm. This event is organised by the Federation of Indian Associations ACT to bring together the whole community and bring awareness to the people of India's contribution to the Australian society. This celebration of Indian culture will include food stalls, cultural displays, tourism, live music, DJ's, clothing stalls, spirituality and information about traditional health practices such as Ayurveda. Kids will enjoy the jumping castle and face painting. There is also a chance to win a free trip to India! Free Yoga sessions will be held at 11am - see the FINACT Facebook for details. Why? Celebrate India's culture, music & food!